Note: Female vines only supplied, un-named commercial selection. Hop plant, Humulus lupulus, has been an ingredient of beer for thousands of years. The young shoots are a traditional springtime vegetable in Europe. A calming tea and a digestive bitter. The leaves are stuffed into a pillow to induce sleep. Approved by German Commission E as a remedy for insomnia, anxiety and nervousness. 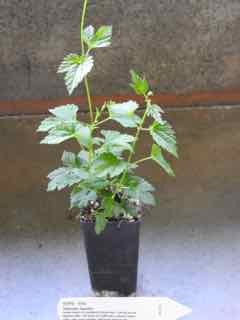 Hop plant6 is a native of the UK and is adaptable to most soils and prefers and open, sunny position. Flowers are yellowish green, the male with loose panicles and the female in catkins. Frost resistant but drought tender. A perennial deciduous vine, climbing to a height of 6m. Plants provided are female from commercial stock. The selection is not named and makes a very aromatic hop brew. Be the first to review “Hop, plant” Click here to cancel reply.